Make an effortless play for attention at the next promotional event using this Smoothy Grip Whites pen! An industry favorite design, it features a solid white barrel, rubberized colored grip, matching trim colors and an imprint with polished chrome accents. 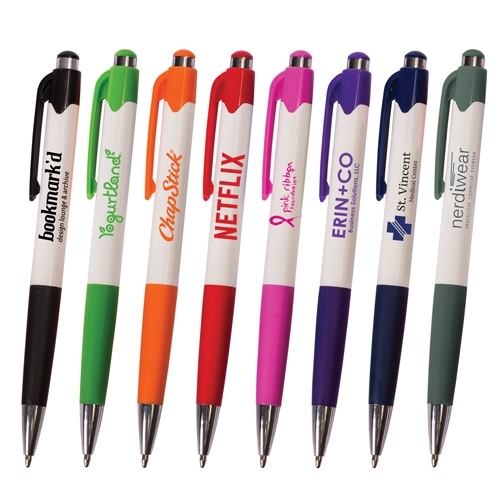 Add your company information to this medium ballpoint plastic pen before handing it out to recipients. It has black ink and you can choose from four trim color options to create a unique look. Assorted colors are also available. A big impact is exactly what your business needs! Imprint Area	1.85" x .65"
Imprint Color	Coordinates with Trim Color. Black Imprint on Assorted. 5.39"(L) x .41"(D) Circumference: 1.29"
Order clearly marked "48 hours"